Ever wanted to see 200 elephants coming together in the wild nature? 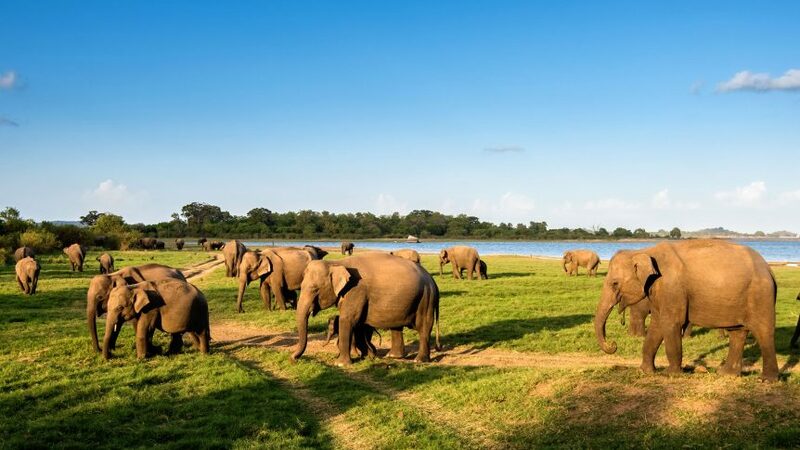 Every year between the months of July and October, up to 200 wild elephants come together on the receding shores of the reservoir for the Minneriya Elephant gathering in Sri Lanka. No wonder it’s been voted as one of the sixth largest wildlife gatherings by Lonely Planet. The best way to experience this most unique natural sight is with guided excursion arranged by Diyabubula, a local art&jungle hideaway. Located in the heart of the Sri Lankan Jungle, Diyabubula is an innovative new destination designed to celebrate the wilderness of Sri Lanka and the works of its most renowned Sri Lankan artist Laki Senanayake. Ideally located near the Minneriya National Park, this is the perfect opportunity for you to witness one of the most incredible wildlife gatherings in the world. Diyabubula itself is a unique jungle hideaway designed by Laki himself which has five individually handcrafted villas made from 100 year old railway sleepers and locally sourced timber. Encompassing the surrounding environment, Laki uses the growing trees and running waters of Diyabubula to create living, natural accommodation so you not only see the jungle but experience it at its core. Laki’s studio is centrally located and he regularly encourages guests to join him to draw, paint and discuss the abundant wildlife that adorns the area. In keeping with the natural environment of Diyabubula, a highly skilled team of chefs are on call to prepare fresh and locally sourced organic food for the duration of your stay.